On Saturday Francois Hollande declared the Paris terror attacks as an "act of war" that needed to be "mercilessly" dealt with, sparking speculation of an increase in action against Islamic State. But despite the outrage, there are still many legal questions surrounding western military intervention in Syria. The attacks in Paris, which have left about 130 people dead and hundreds more injured, have prompted debate about what is the best course of action to tackle ISIL, the group identified as perpetrating the tragedy. French and US forces have already stepped up their bombing campaign in reaction to the weekend's events, unleashing a series of airstrikes on the terrorist group's stronghold of Raqqa in Syria. The attacks in Paris and Lebanon, along with the recent downing of a Russian jet in Egypt, which is suspected to have been the work of terrorists, have also prompted discussion about whether additional military resources, including placing boots on the ground, should be seriously considered in the fight against ISIL in Syria. All eyes have turned to NATO, with speculation that the attacks on France, described by Hollande as an "act of war", could trigger a collective defense clause in the alliance's foundation treaty which could pave the way for NATO member states to step up military intervention against ISIL. While France hasn't yet evoked Article 5 of the Washington Treaty, NATO Secretary-General Jens Stoltenberg has said the alliance will continue to support French authorities in their fight against the terror group. Article 5, the NATO clause concerning collective defense provisions, has only been invoked once, following the 9/11 attacks, which allowed NATO states to back up US military intervention in Afghanistan after evidence found that the attacks were directed from the Middle-Eastern country. 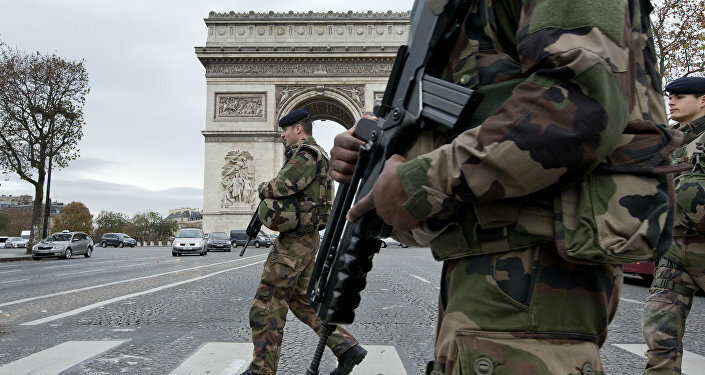 Many commentators have noted that if more evidence surfaces suggesting the recent Paris attacks were directed by ISIL officials in Syria, there could be more calls for France to invoke the collective defense treaty. However, if even more concrete proof emerges that the French attacks were masterminded and directed from inside ISIL bases in Syria, NATO states would still face more international legal hurdles over the question of increased military intervention, principally because ISIL is not considered to be a legitimate state. In similar international law cases against non-legitimate states, the right to self-defense has been ruled to be unlawful. Why was it terrorism when France was attacked but when France bombs Syria and innocent civilians are killed it's "retaliation"? This was demonstrated in a 2004 International Court of Justice decision, which ruled that Israel's construction of a security wall in the Palestinian territories was illegal, as self-defense clauses could only be invoked against states, and Israel hadn't recognized Palestinian statehood. The precedent also opens up many questions about the legality of the US-led international coalition's current fight against ISIL positions in Syria. While the US, France and other countries have justified their decision to bomb ISIL targets in Syria based on threats to national security, the fact that many states haven't sought the approval of Bashar al-Assad's Syrian government raises more legal questions. The issue of legality is also central to the ISIL debate in the UK, with lawmakers — seemingly still affected by the illegal Iraq invasion of 2003 — unwilling to ratify a military campaign in Syria without UN approval. While the West has criticized Russia's intervention in Syria in recent times, officials in Moscow point out that unlike the legal uncertainties surrounding the US-led anti-ISIL campaign, Russia has clearly adhered to international law, by becoming involved in Syria following a request from Damascus. So, despite many agreeing with Hollande that the weekend's tragic events need to be dealt with mercilessly, it seems there are still many legal questions as to whether the West can wage all out war against ISIL.